Beach days, bicycle rides, camping, gardening, or just relaxing on the porch all bring soft summer days to mind. This is our time to revel in all the season can offer, and your dog wants to claim his favorite spot: right by your side. With a little planning and imagination, your best friend can be a part of your summer adventures. Water, Water, Everywhere: The best beach days for dogs are cloudy ones when the sand is not too hot for sensitive paw pads, but even sunny days on the sand can be successfully navigated with some consideration for your dog’s comfort and safety. Take a look at your dog’s nose. The area just inward from the tip, atop his muzzle, is vulnerable to the sun’s sizzling rays. Your dog can’t tell you when he is roasting, so grab some doggie sunscreen and dap it on this kissable part of his face. Plan to bring a beach umbrella for relaxing in the shade after romping on the shore. Leave space in your beach bag for doggie essentials like water and a bowl, plus sunscreen and a floating toy. Plan for some playtime when you arrive at the beach. Your dog will need to expel some energy before he’ll let you plop down with a good book. It may be hard to believe, but not all beachgoers adore your dog’s exuberant greetings. Good beach etiquette suggests that we leash our dogs on busy days and whenever people are nearby. A loose dog flying toward beachgoers is akin to other people’s children invading your picnic, eating your chips, and kicking sand on your towel. Off-leash dogs can also wreak havoc with delicate dune environments and the wildlife that depend on these nesting sites. Consider the needs of others on the beach and your dog will elicit smiles instead of complaints as he prances at your side. In the Swim: Ball-crazy dogs on the beach will ford into the waves heedless of their own safety to retrieve that bobbing ball. Rip currents and fatigue are big factors for dogs that brave the waves, so keep your pet safe and stylish with a life jacket made just for him. Unlike the old orange vests we wore in sailing class, these new high-tech life vests fit sleekly on the dog’s body and allow freedom of movement in the water and on land. As your dog grabs that ball and swims back to you, the life vest will lift his head fully out of the water and he can surf the bubbly wave into shore like a pro. Outdoor: On temperate days, everyone wants to be out on the porch or in the yard, but playful puppies digging in the dirt can ruin your pretty summer garden. Keep your pups close and contained in the Convertible Indoor/Outdoor Playpen. The six-panel pen gives them room to tumble and tussle, and the optional Convertible Pet Comfort Mat II can be used as a clean and smooth floor to keep them clean and protect from insects, or attach it to the top to give them shade. Like the rest of the versatile Richell USA line of products, this offering converts easily from a pen to a gate for use indoor or out. Family Affair: Kids are finally out of school and parents are using this break time to plan a getaway. Travel with the family dog can be a rewarding and memorable bonding experience for everyone, but getting to your destination can be stressful. Mobile Pet Carrier from Richell USA offers quality construction and safety features mean you can concentrate on the adventures you will have when you arrive instead of worrying about the journey. The Mobile Pet Carrier meets or exceeds most airline safety standards (IATA). The special latches on the door and the double handles on top provide stability and allow for smooth lifting, which is a must for air travel. Skip the extra cart at the airport because the Mobile Pet Carrier rolls easily on sturdy, built-in wheel casters, just like a carry-on suitcase. In the car, pull the seat belt through the handles for safety on the road. Family and friends may wish to come to you, and Richell USA can help you welcome their dogs into your home with an array of products for your comfort and theirs. PAW TRAX Doggie Pads are essential when confining a visiting dog in an area of your home. 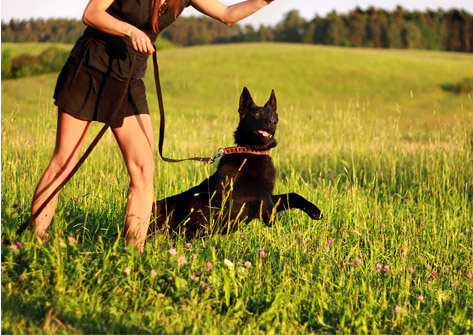 Changing the dog’s environment and routine while on vacation can upset the dog’s normal schedule, and the pads create an indoor option that is convenient and clean. Your visitors will appreciate your consideration. Richell USA has gates for small, medium and large-sized dogs that help keep your dog close to family activity but away from off-limits areas like sofas and fine rugs. The stunning Premium Plus Freestanding Pet Gate is tall enough to stylishly parcel off dog-friendly areas, and the walk-through door makes it easy to pass through from room to room. Chilling Indoors: The dog days of August may drive you inside, closer to the air conditioning. Use this home environment to challenge your dog’s brain power with some fun, indoor games to test his intelligence and adaptability. Grab three large paper cups and a meaty treat. In full view of the dog, place the treat under one of the cups and then slide them around and around. Then sit back and enjoy watching your dog problem-solve. All dogs have a different style. Some will nose the cups gently, others will paw at them, and some will employ the most direct approach; knocking them over with a bump of the head. In any case, you will love watching your dog’s excitement as he waits for you to set up the game. Another fun homemade toy that will occupy your dog can be fashioned from a tennis ball and a dish towel. Place the ball on the floor and drape the towel lightly over it. Watch for your dog’s method of extraction. He may pick up the ball and towel in his mouth, or nose it around and try to uncover it in that way. According to canine intelligence experts, the smartest dogs will pluck the towel up in their teeth and toss it aside to uncover the ball. If this describes your dog, you will need to find fun ways to keep this canine Einstein occupied. Summer represents our time to relax into the sweetest season. Whether you enjoy hiking and biking or just napping on the porch while soft breezes drift over, your dog is waiting for an invitation to join you. Keep his safety and security in mind, and the long, sultry days can be memorable well into fall.